Some quilt projects are designed in my head in a general way though they unfold color and piecing wise as I go along. This landscape triptych is one of those quilts. I had made a large background quilt upon which I thought I would make several different quilts which could be hung interchangeably on the background quilt. I did a previous blog about this. Well, the idea didn’t catch on and I sold the only quilt I had made to fit “on top of” the background quilt. So, I had this large navy blue quilt upon which I wanted to sew another quilt. You heard right….an art quilt on top of a background quilt. I decided to use the background quilt fabric as the border fabric for my top quilt which would make both quilts coordinate better as art quilts. 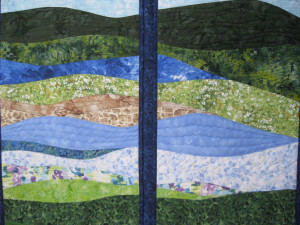 I designed a rolling abstract landscape quilt in blues, greens, and browns. These are such fun to make because the fabric choices and the colors, prints and designs of the fabric, play such an important role in the overall design of the quilt. 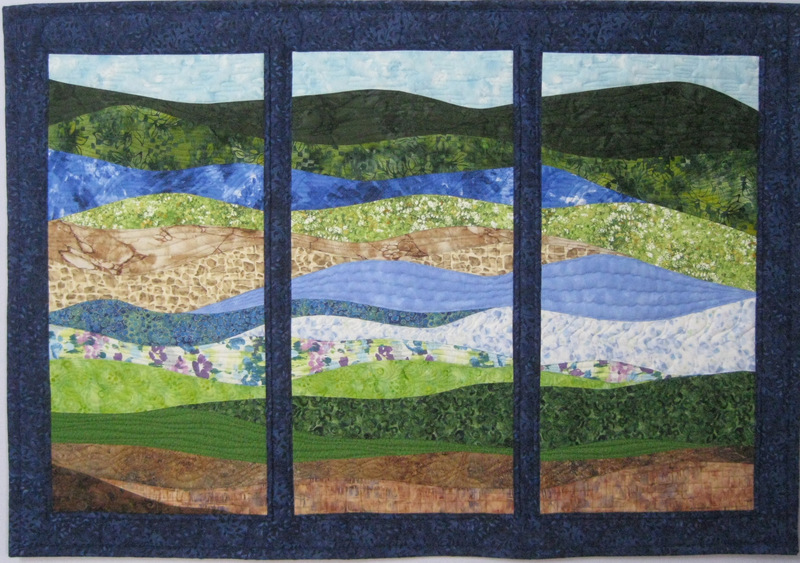 When I finished piecing the landscape and placed it on the navy blue quilt to see how it looked, it looked good but didn’t have any pizzazz! It wasn’t unique enough for me. 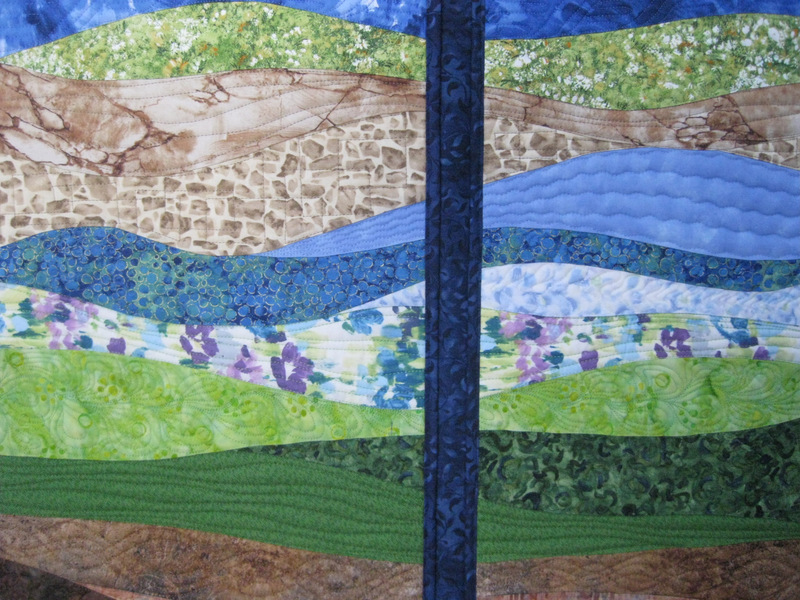 So I decided to cut the landscape into three equal sized rectangular quilts and create a triptych. NOW…when I used the large background quilt fabric to bind each of the three landscape quilts, that binding just disappeared into the background and let the triptych landscape star as a unique art quilt. 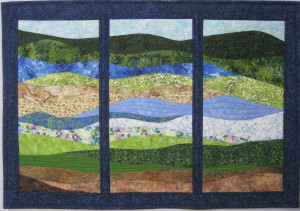 I carried similar free motion stitching across the curved piecing of each landscape panel which further bound together the design across three quilts. By sewing the triptych on top of another quilt, it also created a three dimensional effect. It is fun to try new things and really fun when they turn out to be something unique!